I am on a pumpkin kick! I love pumpkin recipes this time of year. The smells of cinnamon, nutmeg, and more floating through the house as this bread bakes is enough to make anyone hungry. 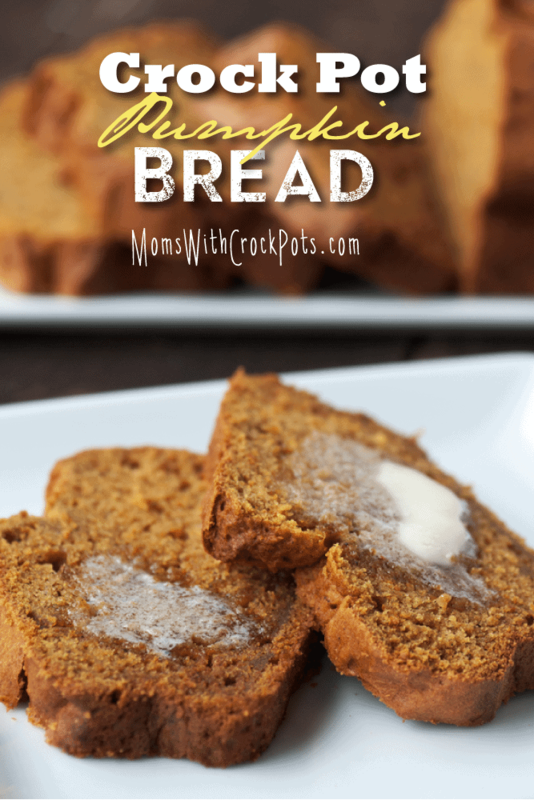 Your whole family will love this simple and delicious Crock Pot Pumpkin Bread . Serve it with some honey butter, or even make french toast out of it for a super special breakfast! In a mixer beat the oil and both of the sugars together. Pour the batter into a greased and floured loaf pan. Add two cups of water to your large crockpot and place the pan into a crock pot. This works best with a 5qt or more crockpot, check that the pan fits before you place the bread dough inside. Cover the top of the crockpot with several paper towels. This prevents the condensation from making the bread soggy. Place the crock pot lid on top of the crockpot (holding the paper towels in place.) Bake on high 2½ to 3 hours. I had never made pumpkin bread before and this was amazing!!!!! I swirled carmel sauce over the top when it was still warm. Oh and I cooked it in the oven. Wonderful recipe!!!!! Making it again today!!! !